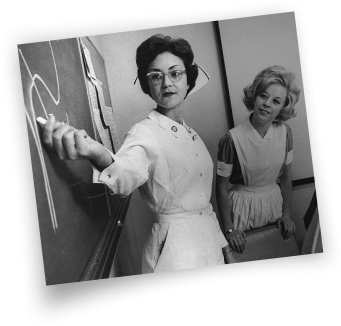 Ida Moffett School of Nursing has a rich history in nursing education. Since 1968, we have prepared students to provide quality, patient-centered care. Ida V. Moffett once said, "Before great things are accomplished, someone has to dream a dream." The Birmingham Baptist Association founded the Birmingham Baptist Hospital School of Nursing in 1922 with the goal of educating nurses to meet a desperate need for skilled practitioners. Originally established as a hospital-based diploma program, the school was renamed the Ida V. Moffett School of Nursing in 1968 and became the first program in Alabama to achieve accreditation by the National League for Nursing. While the Ida Moffett School of Nursing has experienced significant growth and transformation since its foundation, the school's objective remains unchanged: we prepare students to provide exceptional, compassionate, patient-centered care. In 1973, following a merger agreement with Baptist Health Systems, the nursing program transferred to Samford University and began offering associate and baccalaureate degrees in nursing. In 1988, the nursing school moved to the Dwight and Lucille Beeson Center for the Healing Arts on Samford's campus. The school now offers baccalaureate and doctoral degrees in nursing and is located in Samford's College of Health Sciences. While the Ida Moffett School of Nursing has experienced significant growth and transformation since its foundation, the school's objective remains unchanged: preparing students to provide exceptional, compassionate, patient-centered care. The school focuses on four foundational pillars, all of which are based on the vision and passion of Mrs. Moffett: academic excellence, compassion, caring and service. It's because of this approach that the school is recognized as a national leader in nursing education. For more than 90 years, Ida Moffett School of Nursing has continued Mrs. Moffett's legacy by instilling her unique vision and passion in those called to the nursing profession. Today, more than 5,000 Moffett nurses are impacting the lives of others throughout the United States and around the world.